The Original Beater Blade by New Metro Design is an electric mixer attachment which thoroughly mixes batter, eliminating the need to stop and scrape the bowl manually and is engineered for use with most KitchenAid 6qt bowl lift mixers. The new Beater Blade beats, scrapes, folds and incorporates ingredients thoroughly for fool-proof baking. The Beater Blade ingeniously improves on the functionality of standard V-shaped beaters offered with high-end stand mixers by crafting a high-quality, enhanced blade that includes a flexible rubber wing down the entire length of both sides of the blade. The durable, food-grade edging simulates the action of a powerful spatula to gently, yet thoroughly scrape the bowl clean. The wing-system design acts like a wiper blade that continuously scrapes sides and bottom of bowl while it mixes virtually eliminating hand-scraping and batter build-up on the blade. BeaterBlade’s state-of-the-art design continuously and automatically scrapes batters during mixing, which can speed up the process by as much as 50 percent. By eliminating the need to turn off and on the mixer to scrape the bowl, Beater Blade reduces wear of the motor of the mixer, as well. Blade is intended to be used only once ingredients have been added to the bowl—not for use in a dry bowl. 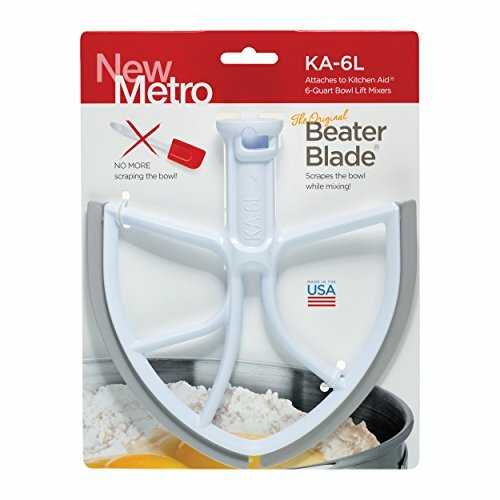 New Metro Design’s Beater Blade excels in a full range of mixing applications, including creaming butter, sugar and eggs to fluffy perfection, and preparing frostings and pastry creams quickly and easily. Model KA-6L fits most KitchenAid tilt head mixers regardless of the KitchenAid model numbers. KA-6L Beater fits following Mixer Models: Professional 6 & 600, Deluxe Epicurean: KD2661X, KP26M8X, KT2651X, KP26N9X. Professional 5 Plus: KV25GOX, KV25G8X, KV25HOX. This mixer is not compatible with KitchenAid mixers KSM657 and all Costco and Sams Club KitchenAid Mixers. Continuously beats, scrapes, folds and mixes ingredients for KitchenAid Bowl Lift Stand Mixers. Fits most KitchenAid 6 quart and lift mixers, it is not compatible with KitchenAid mixers KSM657 and all Costco and Sams Club KitchenAid Mixers. The Beaterblade is designed for the standard bowls that come with the mixers, specialty bowls may not work, however it does work for the glass bowls. Reference "Which Blade Do I Need?" at our website for a complete list. Made in the USA and Dishwasher Safe. Do not purchase units Made In China. If you have any questions about this product by New Metro Design, contact us by completing and submitting the form below. If you are looking for a specif part number, please include it with your message.